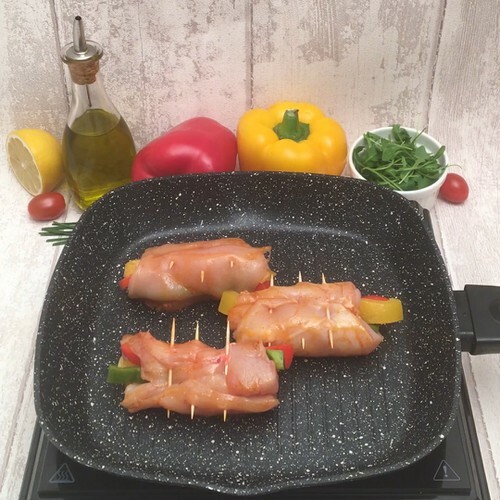 In a dish, place the chicken breasts and add the lemon slices, a drizzle of oil, the chopped garlic, paprika and chilli powder. Coat the chicken breasts in the mix. Char the skin of the peppers over an open flame, then put them in a Ziploc® bag. Wait 2 minutes before removing them from the Ziploc®. With a knife, scrape the skin off the peppers and cut them into slices. Cut open the chicken breasts, and put salt and pepper inside. Place a slice of each pepper horizontally inside, and close the chicken breasts by folding the sides. Secure with 3 toothpicks. Fry the chicken breasts for 5 minutes on each side. Decorate with chives and enjoy with salad and cherry tomatoes on the side.